Home / world / Egypt:Defiant Mursi tells court: I’m ‘legitimate’ president. Egypt:Defiant Mursi tells court: I’m ‘legitimate’ president. Ousted Egyptian leader Muhammad Mursi struck a defiant tone on the first day of his trial on Monday, chanting ‘Down with military rule’, and calling himself the country’s only ‘legitimate’ president. Mursi, who was toppled by the army in July after mass protests against him, appeared angry and interrupted the session repeatedly, prompting a judge eventually to adjourn the trial, which barely got underway, to Jan. 8. Opponents of Egypt’s army-backed government say the trial is part of a campaign to crush Mursi’s Muslim Brotherhood movement and revive a police state reminiscent of Hosni Mubarak’s three- decades of autocratic rule that ended in a 2011 popular revolt. Mursi, 62, who broke out of jail in Mubarak’s final days in power, found himself behind bars again facing charges of inciting violence that could carry the death penalty. It is the second time in just over two years that an overthrown president has been in court in Egypt. The trial is taking place in the same venue where Mubarak has also been facing a retrial for complicity in killing protesters. “This trial is illegitimate,” said Mursi, who was dressed in a dark suit and who state media said had refused to wear prison clothes. 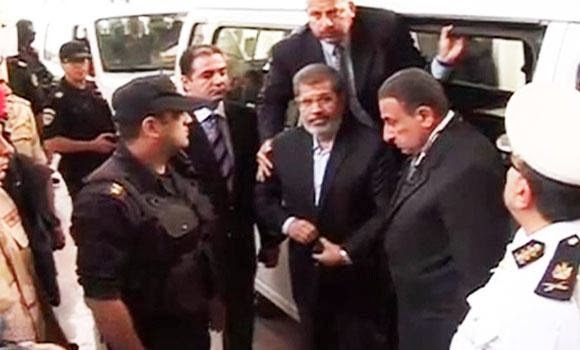 Mursi traveled to the heavily guarded courthouse from an undisclosed location by helicopter. Hundreds of his supporters gathered outside the court building. One sign read “The will of the people has been raped,” a reference to the army takeover. The now-banned Muslim Brotherhood has said it will not abandon the street protests it has staged to pressure the army to reinstate Mursi. But a heavy security presence across the country served as a reminder of a crackdown earlier this year in which hundreds of Mursi supporters were killed and thousands more rounded up. The trial was not aired on state television and journalists were barred from bringing their telephones into the courtroom set up in a Cairo police academy. During his appearance, Mursi made a Brotherhood hand gesture to express his disgust at a raid in August on a protest camp by security forces, who shot dead more than 200 people there at the height of their action. Mursi and 14 others face charges of inciting violence relating to the deaths of about a dozen people in clashes outside the presidential palace in December after Mursi enraged his opponents with a decree expanding his powers. State media said Mursi, who until today had not been seen since his ouster, would be moved to Borg Al-Arab prison in Alexandria. Earlier, a security source said he would be transferred to Cairo’s notorious Tora prison. “It is clear that the goal of this trial as well as any action against the Muslim Brotherhood is to wipe out the group as well as any Islamic movements from political life,” said Mohamed Damaty, a volunteer defense lawyer for Mursi.